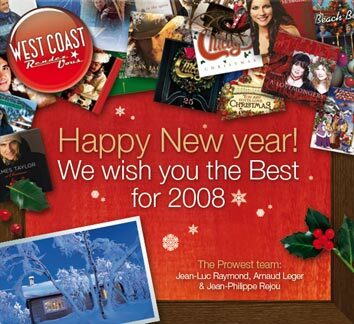 Westcoast Rendez-Vous Staff wish you a Happy Rockin' New Year 2008 from Paris, France. We wanna thank sincerely artists, musicians, producers, labels and records companies, medias, radio dee jays, webmasters and concert promoters who help since more than 15 years our non profit organisation Prowest for interviews, news and reviews and partnerships to give you real informations. We want to thank subscribers and people who read and contribute to this blog since 2004 and we still do our best to give news and reviews about what we have in common: we love Westcoast Music and AOR. We have started our new blog in French in late october... Please also read it and tell about it by word of mouth! The Encyclopedia of Westcoast Music and AOR that we have published for Christmas for free (you can download it in 3 files here) is one of our dedicated gift for this music. Enjoy it and please feel free to tell about it! The Best for the New Year... with More Music! New: Westcoast Rendez-Vous in French too! As promised, here are the first steps of Westcoast Rendez-Vous made in France... And in French for the French speaking fans. Enjoy the first news and views in French. This new blog "Westcoast Rendez-Vous made in France" will have a new lay out soon as well as French links. Hope you enjoy the challenge! Stay tuned for Wescoast Music in French also! These are strange days for Westcoast Rendez-Vous website. A french website has found such a little not so funny game to play by simply doing plagiarism in translating some of our original articles in French. Quite evidently for this website, there is no backlinking and the translation word by word has some defaults (including errors of translation in the meaning way). We don't link this website here and we will continue to maintain our efforts here to give you news you wish for the music we kindly love and promote as volunteers since more than 18 years. Oh! I just forgot and that's a real big piece of news: we will have a blog in French too very soon. We know that many french speaking fans will appreciate that. We will do it! And this one will be online in quite a very few days. Stay tuned for more Westcoast Music on Westcoast Rendez-Vous and Keep on Rockin'! Hi, just a word to share with you this project I released for the Chicago 40th Anniversary Contest organized by Rhino Records. The album's cover art and internal graphics were selected through a fan contest with long-time fan Mark Rosenmeier cover chosen from over 400 entries. Inside, 10 of the runner-up designs are included and I am proud my design (3 hours of work) has been chosen to be included on the Liner note. That's FUN! 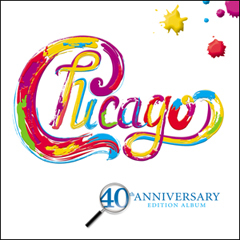 The concept idea of my work: the songs from past to present are like colors and paint with vitality the Chicago logotype to celebrate the band 40th Anniversary and new music to come. I also used the magnifying glass of Chicago 16 cover to enlarge the number 40 and to remember that album was important in the carreer of the band produced by David Foster with one of biggest hit "Hard to say I'm sorry".